Research has shown that regardless of the physical skill being taught, learners have some distinct commonalities. If we as coaches understand these similarities, we can use them to ensure success for our students. According to one of the earliest theorists in the area of motor learning, ER Guthrie, physical skill proficiency is “the ability to bring about some end result with MAXIMUM CERTAINTY and MINIMUM OUTLAY OF ENERGY”. Simply put, when the time we have available to spend with our students is limited, we need to be as efficient and effective in our coaching as we can. 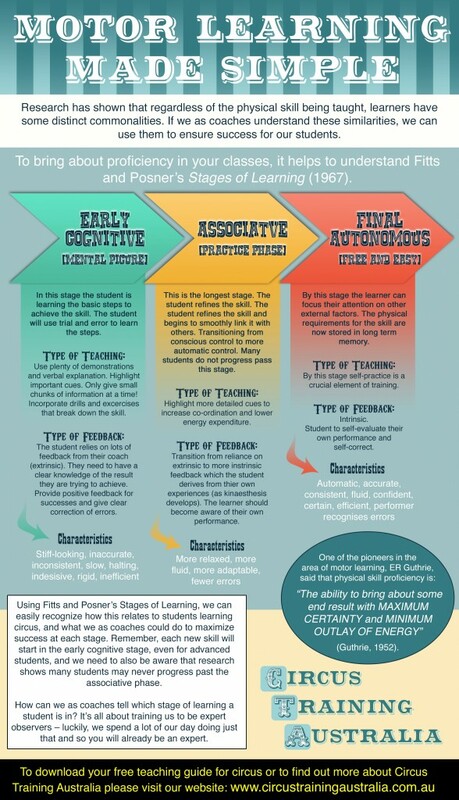 To bring about this proficiency in your classes, it helps to understand Fitts and Posner’s stages of learning. Most coaches intuitively work by these paradigms, but the more you understand them, the more you can exploit them for your student’s benefit. In this post I will explain the three different stages of learning, I will give you some examples of a circus student in each stage, and how you can leverage these stages to better inspire your teaching. Below I’ve include an infographic to give an overview of the concepts, and I go into further detail with examples in the text below. In this stage the student is learning the basic steps to achieve the skill. It’s easy to observe when a student is at this point of learning, typically when attempting a skill at this stage they look awkward, and will be inconsistent in replicating what they have learnt. You know the look on the face of someone practicing a new trick, there is an element of confusion as they try to remember which way to wrap the tissu around their foot, or which leg they like to step forward on in order to start their cartwheel. With your guidance as a coach, the student will be using use trial and error in order to learn the steps – in the case of a cartwheel, you may see them step forward on one foot and then change their mind. As such it is crucial to use a combination of demonstrations, verbal communication and plenty of drills to break down the skill. Take the time to consider the most important teaching points or cues and focus on the ones that are going to make the biggest difference in helping your student achieve success. Feedback from the coach is also very important at this stage, both during and after they attempt the skill. Be sure to give your student a clear understanding of what you want them to achieve – e.g. “when you finish your cartwheel, you need to be standing up in a star shape”. Set them realistic goals, and give them lots of positive feedback for their success. For any errors, make your corrections clear and relate it to how the change will help them achieve their goal e.g. “next time you wrap your foot on the tissu, get your second leg higher in order to give you more space”. This is the longest stage in learning, and once the student is at this stage they are very familiar with what they are trying to achieve. This is the point when the coach can name the skill and the student is able to attempt it without prompting e.g. the coach asks “do a birds nest on that trapeze” and the student knows how to hold on to the trapeze, get their legs up and into position, and come out of the trick. A satisfying characteristic of this stage is that the student can usually identify how well they are performing the task, and this is an important change. They may be able to ‘feel’ that they didn’t do the skill right, or perhaps upon watching a video of themselves they quickly realise what they need to improve without any or much prompting. The coaches’ role is to make feedback more detailed and nuanced, finding ways to help the student achieve the skill with less energy and more finesse. During this stage the student refines the skill and begins to smoothly link it with others, such as putting together a sequence of tricks or a routine. The student transitions from conscious control to more automatic execution of the skill. Research has shown that many students do not progress pass this phase, and perhaps achieving a comfortable understanding and stringing together a simple routine is challenging enough. Certainly at a fun, recreational level of circus there is no need to move to the final autonomous stage of learning. A good, associative understanding of a small repertoire of tricks may be enough for the student to happily take part in your end of term showcase. By this stage the student can focus their attention on other external factors. Typically in circus this may mean that they are not only thinking about how they sequence a range of tricks together, but also focusing on the emphasis they give to each trick, the speed they wish to execute it, incorporation with choreography or interaction with other performers and the audience. The physical requirements for the skill are now stored in long term memory, more seasoned circus types will often talk about being able to do their act under duress because it’s “all stored in muscle memory”. At this stage, the circus artist is most often the best person to give themselves feedback on their execution, and will immediately recognise any errors that may occur. In most cases these errors will be minor, and most often related to the fluidity and confidence in which they are performing the skill. Hopefully after reading this post you will now be able to easily recognize each of the three stages, how it relates to your circus students, and what you need to do to maximize success at each stage. Remember, each new skill will start in the early cognitive stage, even for advanced students, and bear in mind that research shows many students may never progress past the associative phase. I would love to hear your thoughts on this post. Do you already recognise these stages of learning intuitively? Does reading about them help reflect on your teaching in a different way?